TRAIL TRIALS - Equestrian Trails Inc.
A Trail Trial is a judged competition on the trail using natural and man-made obstacles, judging the horse/rider combination on their performance under difficult situations they may come across on a modern day trail. The program provides a Standard Set of Rules for each of ETI National’s Corrals to use when judging competitions. These competitions can be done by any rider no matter what their level of experience. Check the Local Corral Event Calendar for upcoming Trail Trials. Mark Your Calendars!! See you in Hansen Dam on October 19! More details to follow. This TT will benefit ETI National. 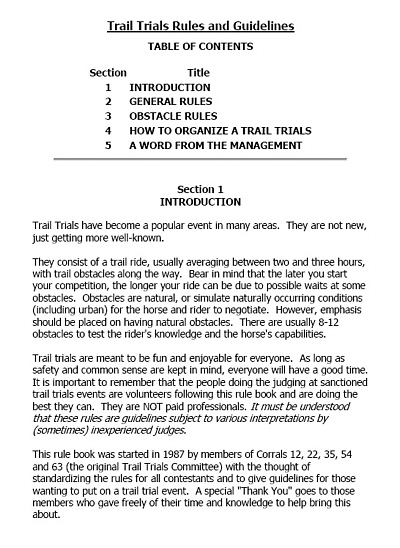 The rules for Trail Trials are contained in this 12-page document which can be downloaded here, then viewed and/or printed.